This post is sponsored by Groopdealz. As always, all opinions are my own. This post also contains affiliate links. When it comes to clothes, it’s no secret that I like statement pieces. 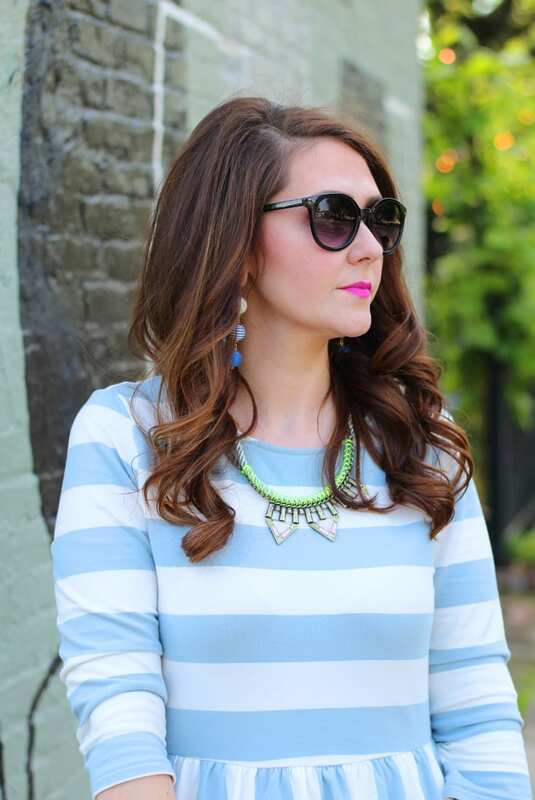 Bold patterns, bright colors, and statement jewelry are all regularly on rotation for me. 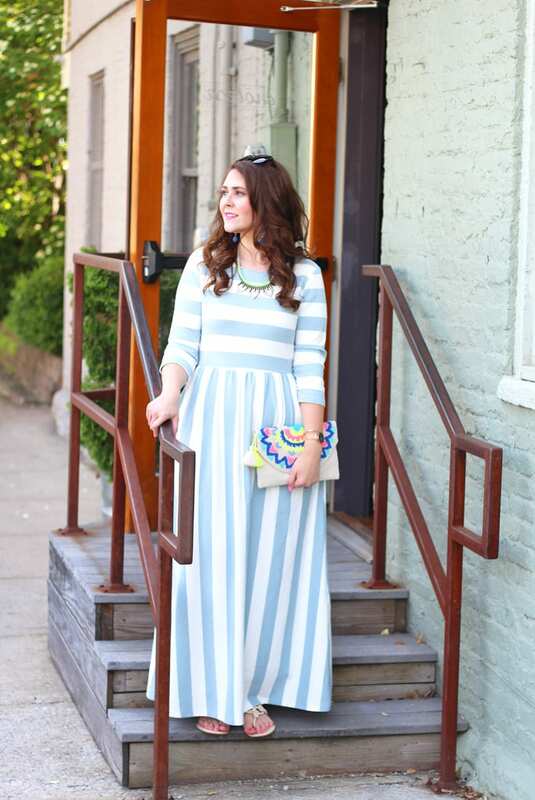 So of course I had to throw all of those into this striped maxi dress outfit! Dress: c/o Groopdealz (similar) // Sandals: Tory Burch Miller Sandals via Ebay (have you seen the florescent colored ones???) 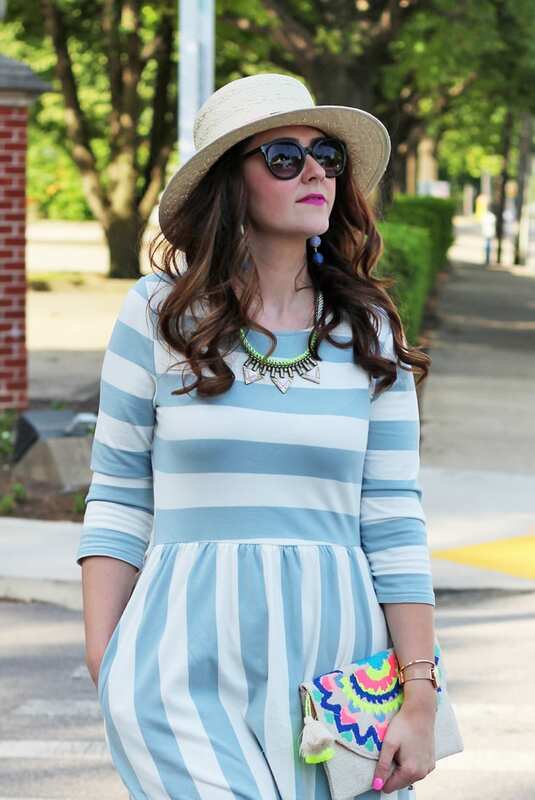 // Hat: Target // Earrings: Charming Charlie // Bracelet: c/o Southern Belle Glitz // Watch: c/o Daniel Wellington–save 15% w/ code BRIGHTONABUDGET15 // Clutch: Target /Necklace: Sugarfix via Target–on clearance! I was recently shopping on Groopdealz (I check their email every morning to see what’s new!) when I came across this beautiful maxi dress. 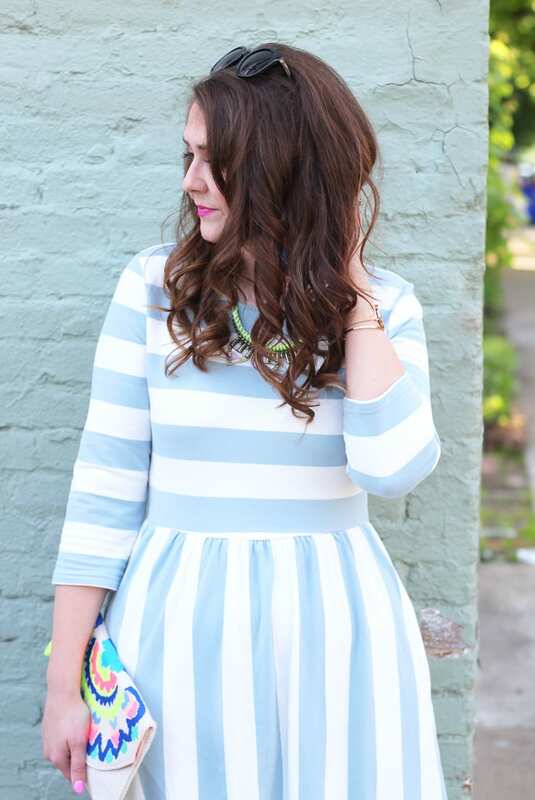 The bold stripe pattern and cut of the dress immediately caught my eye, and when I saw it was only $25, I was sold! For those of you unfamiliar with Groopdealz, it’s a website that offers boutique items at amazing prices! Different shops/sellers offer certain items for sell for a short period of time, like three days, and once the deal’s gone, it’s gone. I’ve seen tons of popular tops, dresses, etc. on there for great deals! This maxi is made of a thin sweatshirt-type of material. It has some stretch to it but isn’t super stretchy. The 3/4 sleeves are good if you’re the type who gets chilly easily (like me). The blue and white color mix is so on trend for this season too! To break up the pastel color, I added bright colors in my accessories. My necklace is a recent Sugarfix find on clearance at Target (see my recent Target finds here) for under $10 in store. I really like the neon green thread and mixed media style. It blend swell with my embroidered clutch (under $15) and my hat. Have you ever shopped at Groopdealz? I’ve ordered a couple of other items I can’t wait to share with you as well! That dress is adorable! Love your neon pops too! Thanks, Becky! I love the mix of neons and pastels! Just the right accessories in the perfect hues ! Great look – oh and I have never shopped from them. Thanks so much! You should definitely check them out–such cute things! Wow – this is gorgeous on you! The first pic of you is stunning! Love this pretty maxi dress! And oh my gosh what a cute hat! I love how much you love patterns, pretty prints and bold colors. 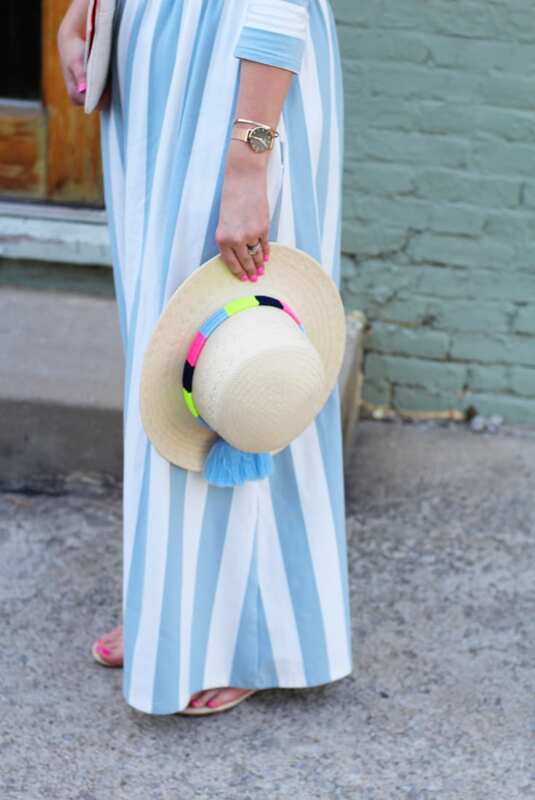 I love, love that pastel maxi. Plus light sky blue especially striped with white is so IN right now. All your accessories are fab. You love Target just as much as me. There are always great things to be found at Tar Jay. 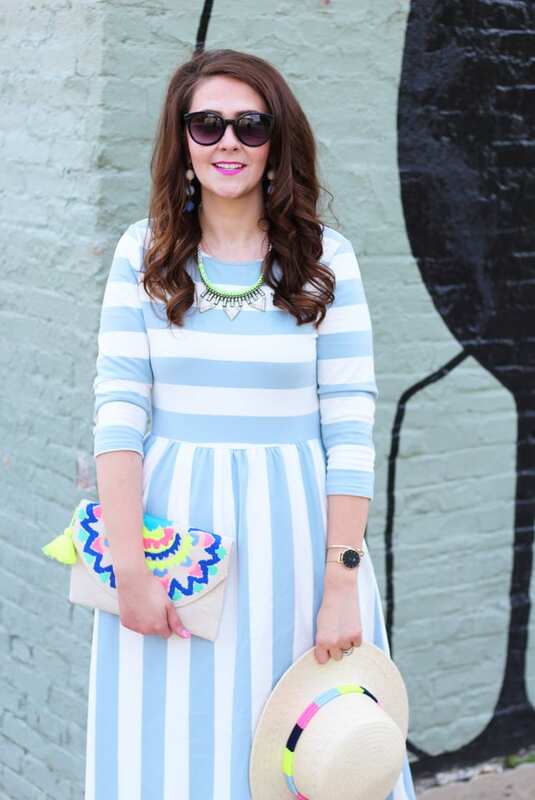 You look good in this maxi dress and I love the bright colored accessories you picked! Wow! 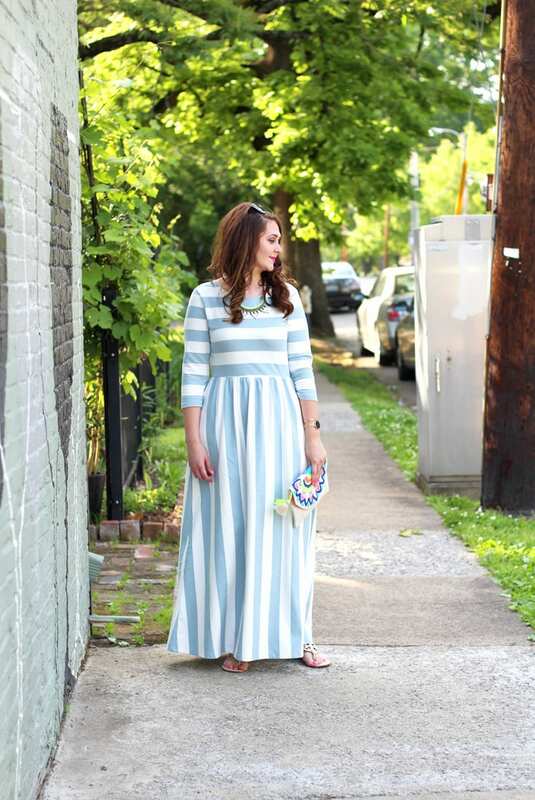 Love your maxi dress. Chic and fab! That dress is soooo cute!!! I just love the stripes and it looks so comfy. I’m going to have to check out Groopdealz. This look is so fantastic!! I love your dress and styled with your bright accessories is just perfect! This dress is SO CUTE. It’s beautiful! I love that clutch!!!! You look so pretty and ready for Spring! This is such a great dress. 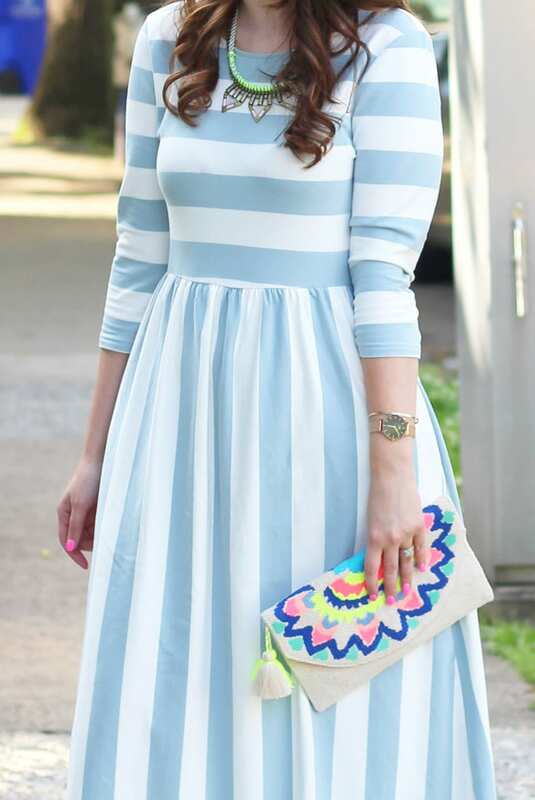 I love the length and the light blue stripes. Such a great look! I love this! I love the alternating stripe pattern! 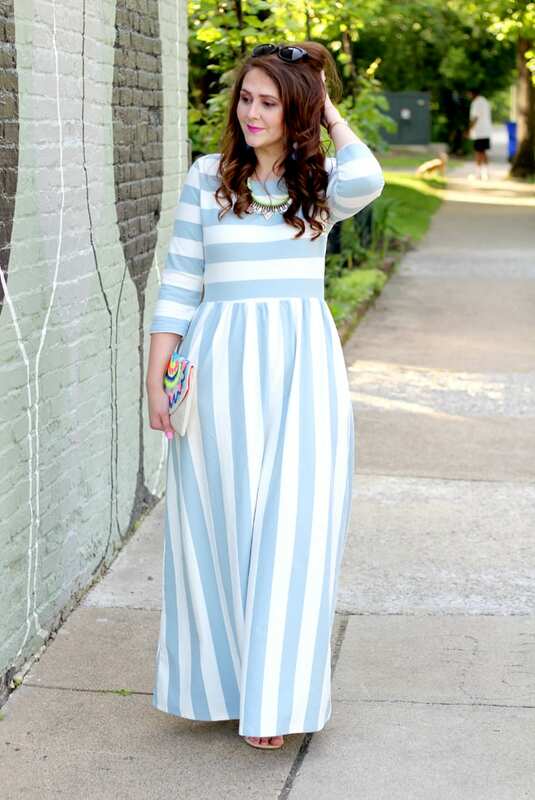 The maxi is really cute, I love the bold stripe and you can’t beat the price! Your bright accessories are just darling with it as well. Such a beautiful dress! I love the colours and I love how the stripes on the top are in a different direction from the bottom. Lovely dress on you and I love the bright accessories! Love this dress – it is so cute!! Girl…this dress is too cute! What a find.